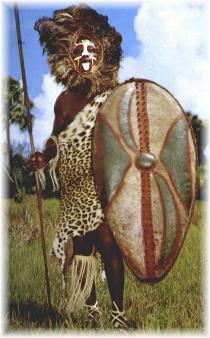 Click here to read a history of Africa U.S.A., America's first cageless African wildlife tourist attraction. Click here to see and learn about all the animals that were found at Africa U.S.A.
Click here to read about the Zambezi Waterfalls, the Watusi Geyser, Princess Margaret, the Diamond Exhibit, Mojah and Mbili and other Africa U.S.A. attractions. Click here for a Virtual Tour of Africa U.S.A. including the Jungle Cruise and the Jeep Safari Train. Click here to visit the Africa U.S.A. virtual museum and see photos contributed by visitors. Click here for an Africa U.S.A. movies, the theme song "Skokiaan", Africa U.S.A. wallpaper and view how Africa U.S.A. looks today. Africa USA in the News! Click here for recent Africa USA newspaper articles. This web site is a history and virtual tour of Africa U.S.A., an African wildlife tourist attraction that was open from 1953 until 1961. The park was located in Boca Raton, Florida on 300 acres of land near U.S.1. The links above contain a history of Africa U.S.A., listing of the animals, special attractions such as the Watusi Geyser, a virtual tour of the park, information about the African Gardens, and a short movie in MPEG format that can be viewed using Real Player or Microsoft Media Player. Africa U.S.A. was truly a theme park before its time, with animals allowed to roam free. Even though Animal Kingdom in Disney World was hailed as a new concept, the idea had existed some 50 years prior right here in Florida. Walt Disney was a frequent visitor to Africa U.S.A. and considered purchasing it. In fact, Africa U.S.A. was chosen over Disneyland to grace the cover of the August 1, 1960 issue of LIFE Magazine. Click here to see the cover. The cute chimpanzee Princess Margaret was the reigning monarch of Africa U.S.A. and was featured many times on the Jack Paar television show. 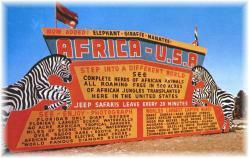 This was the colorful sign located at the entrance to Africa U.S.A. Africa U.S.A. was famous for its billboards that stretched all along U.S. 1. All material contained on this website is protected by © Copyright, whether or not the copyright notice appears on a particular screen where the material is displayed. No part of any material maybe reproduced or transmitted except for brief excerpts for purposes of comment, criticism, educational or non-commercial purposes or as maybe permitted in a copyright notice or statement that accompanies the material, in any form or by any means or stored in a computer for retrieval purpose or otherwise without written permission from the copyright holder. Provided by the web analytics guide. Film from 1956, taken by George Hill. Visit our other web sites - www.gogreenblueplanet.com | www.aresrocket.com.